Halloween is just next week!! I still haven’t finished Dean’s dragon costume but just a few more stitches and it will be done! He is super excited! This is my go to “cake pop” recipe. It isn’t really a recipe for cake pops per se but that’s what I usually call them and it saves me the trouble of baking a cake, letting it cool, turning it into balls and so on. This recipe could not be easier and it comes together in your food processor in no time. You just mix one package of softened cream cheese with one package of Oreos in your food processor and blend till combined. That’s it! Form the mixture into ball, pop sticks in them and then let them set in the freezer. I then melt up some white almond bark (white chocolate) and dip the pops into the chocolate. I set them on wax paper. When they have all been dipped I take them one by one and hold them over the bowl of melted chocolate, dip a fork into the chocolate and then drizzle it all over the pop. Before the chocolate drizzle has time to cool I stick on 2 black sprinkle eyes and you have a mummy pop! I love these much more than traditional cake pops because they are easier and I think they are tastier. I mean come on it cookies and cream on a stick people! 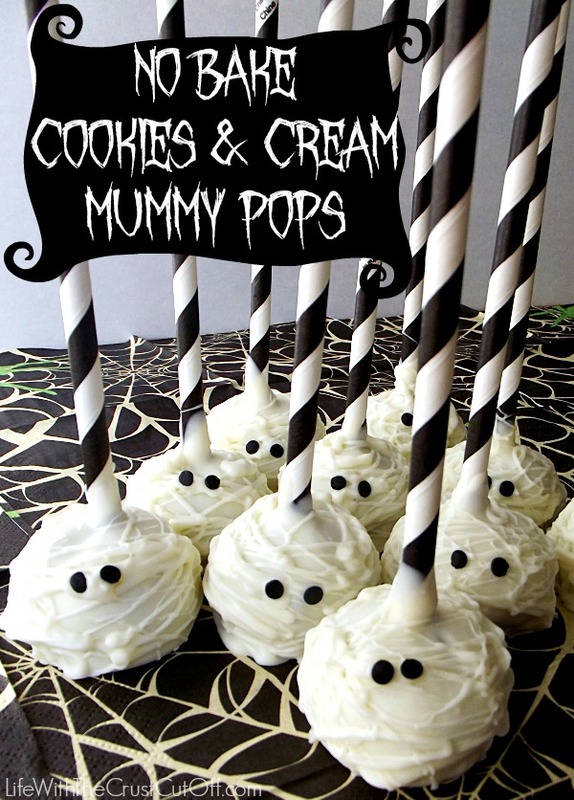 So I hope you make these for a perfectly spooktacular treat this Halloween! Mix one package of softened cream cheese with one package of Oreos in your food processor and blend till combined. Form the mixture into ball. Stick sucker sticks or paper straws in the balls. Melt the white almond bark (white chocolate) in microwave till smooth and melty. Dip the pops into the chocolate and place them on wax paper. When they have all been dipped take them one by one and hold them over the bowl of melted chocolate, dip a fork into the chocolate and then drizzle it all over the pop. Before the chocolate drizzle has time to cool stick on 2 black sprinkle eyes. Parrish, these are SO cute and I love that they are so easy to make! Just Halloween perfect! :) Thanks for sharing and pinning! Hope you are having a wonderful week! Oh! I just love these little guys, and a no bake adorable dessert, yes please! These are so cute. I am going to make them tomorrow! Thank you!! Those just look amazing! and I know how hard cake pops are to make. These are so adorable! I think I’ll give it a try! These are so cute and anything with cream cheese and Oreo cookies must taste FA-BU-LOUS! Thanks for sharing at Simple Supper Tuesday. 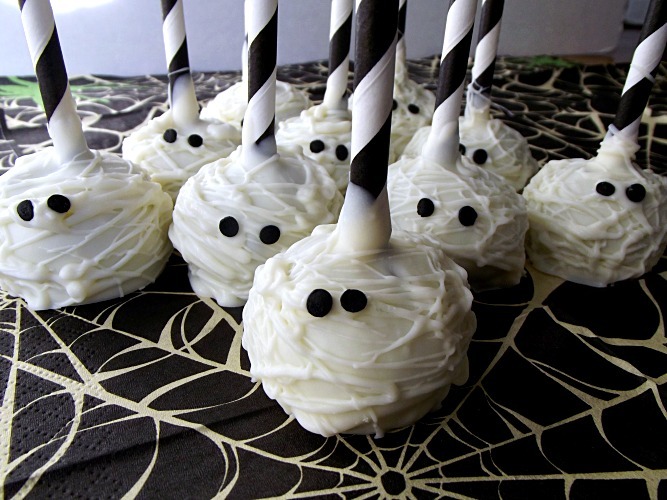 These are the cutest Halloween treats ever! Pinned! Oh my stinking gosh! How cute are these! I HAVE to make some TODAY! These are adorable! If I had more time, I would totally try to make them! This recipe is perfect for me!!! My oven has been kaput for quite a while so I can’t bake anything for the time being and I miss being able to make some sweets. I am going to be pinning this and will be making it ASAP!!! Thanks for sharing! Those are adorable and my husband would flip over the fact that they have Oreos in them! Definitely pinning this one, thanks for sharing! These are too cute and sound delicious. Love these no-bake pops! Pinned ’em and sharing on Facebook, etc. These are so cute! Stopping by from “Thursday Favorite Things”! These are so cute! I’m sad that I didn’t see these two days ago- I would have made them for Halloween. Definitely pinning for next year! Love this idea -way cute! What yummy looking mummies! I love these!!! Oh, I absolutely love these. That was pretty wise to go with cream cheese and oreos, yum! I am not a fan of regular cake pops and this is a wonderful replacement. Thank you for linking up with us at Inspiration in Progress. Have a great rest of your weekend. This looks so yummy! Thank you for sharing this at last week’s Tea Party Tuesdays. It is going to be a featured post at tomorrow’s party. These are adorable! Thank you for sharing at our TGIF Link Party at A Peek Into My Paradise. I hope you will be back to link up another awesome post this week!